Glass Cylinder Vases Color Kit, 10 pieces - shipping included! Cylinder Vase Color Kit - SHIPPING INCLUDED! Create a beautiful light effect with your centerpieces on every table. Each vase sits on an 8" round mirror, that reflect light that is refracted from water beads inside the vase. 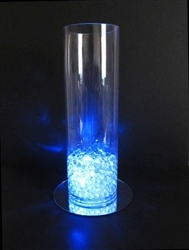 The light source is provided by a single submersible LED light in the bottom of each vase, beneath the sparkling water beads. 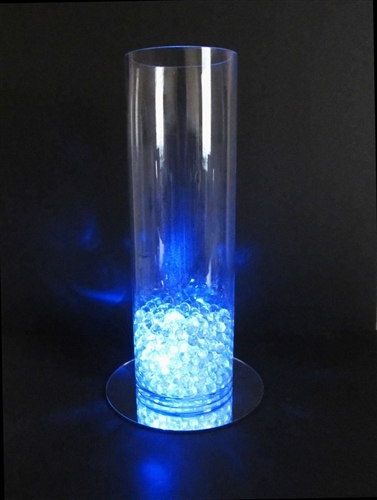 Our cylinder vase color kit includes ten vases, ten 8 inch mirrors, 10 LED lights (9 different colors) and 20 packs of jelly decor water beads (3 different colors). Ten glass cylinder vases, 16" tall, 5" diameter opening (outside diameter). Shipping included, continental USA. Canada, Alaska, Hawaii, Guam, Puerto Rico require additional shipping. Fluted glass vases are extremely fragile- please handle with care. Please inspect your vases upon delivery for breakage. Please click here for our policy on glass vases. Please note that all measurements are exterior (diameter and height), and are approximate. All vases are hand blown and variances or slight imperfections are naturally occurring. All glass vases sold at bloomsandbranches.com are intended to be free-standing, and for floral use only. GREAT SAVINGS. They are very nice. The lights are wonderful.